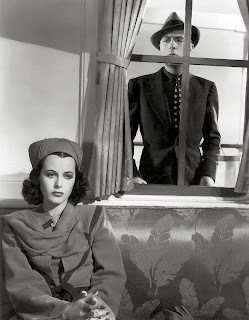 A sweltering romantic drama set in a faraway and mysterious land, Algiers marked Hedy Lamarr's first Hollywood film, an appropriately exotic debut for an alluring beauty. Pepe Le Moko (Charles Boyer) is a jewel thief, wanted in his native France for a series of daring robberies. Pepe has taken refuge in Algeria, and specifically the sprawling, labyrinthine Casbah portion of the capital city Algiers. A pompous French detective arrives to lead a determined search to flush out the fugitive. But Pepe is well protected by the Casbah residents and his inner circle, including the gypsy Ines (Sigrid Gurie), and manages to escape and disappear into the convoluted alleyways. Local police officer Inspector Slimane (Joseph Calleia) is more practical and more patient. He interacts with Pepe everyday, but awaits his chance to lure the criminal out into the City proper, where he can be easily apprehended. Rich French tourist Gaby (Lamarr) stumbles into Pepe while exploring the sights of the Casbah, and they are immediately smitten with each other, arranging to surreptitiously meet over several days. Gaby finds Pepe suave and dangerous, while she reminds him of all that Paris has to offer, and he begins to feel imprisoned within the suffocating narrow passages of the Casbah. 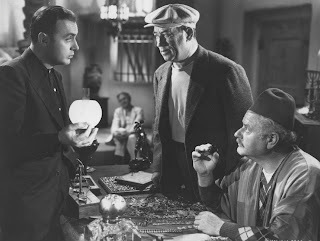 With the clumsy help of informant Regis (Gene Lockhart), Slimane senses an opportunity and tries to devise a plan that will tempt Pepe into the open. A predecessor to more famous foreign adventures such as Casablanca, Algiers is perhaps not as perfectly magical but just as captivating. The film is tightly scripted by John Howard Lawson with additional dialogue by James M. Cain, and efficiently weaves a character-rich story of policing, crime, romance, jealousy and double-cross. Lamarr has little to do except flash a lot of jewelry, stare rather awkwardly into the camera, and deploy a stately and somewhat sad smile. She is a regal presence rather than a performer, but she also undoubtedly adds a touch of class to a production filled with otherwise scrappy characters. While Lamarr's step up to glamorous movie roles is Algiers' most famous calling card, the real star of the film is the set design. The Casbah is the playground of the unwashed and those who want to remain visible but outside the law's reach. Director John Cromwell glides through the nooks, tight corners, steep staircases, hidden passages and cascading roofs to capture a world within a world. It is both a place to keep out intrusive influences and a prison that suffocates its inhabitants, as Pepe gradually finds out. Charles Boyer as Pepe is the perfect noble criminal, surrounded by a clutch of unsavoury associates tasked with the dirty work, all the better to make him appear more sophisticated, a director of plots who makes sure that it is others who get their hands smudged. Joseph Calleia delivers the most memorable performance, his Slimane carrying a patience for the ages, a detective playing the long game with a smile, confident that the field is ever so slightly tilted in his favour and it's only a matter of time before the ball rolls into his court. A colourful, well-developed set of secondary characters helps to turn Pepe's circle into fertile grounds for conflict and chicanery. Algiers cleverly sets up its central location as both a melting pot for locals and a curiosity for tourists, a place where foreigners can visit but not necessarily stay. Both Gaby and Pepe will need to leave the Casbah, at different times and under different circumstances. They can taste the pleasures and enjoy the shelter offered by the secret world, but ultimately they both belong elsewhere, and the old city has the wisdom to send them on their way to meet their destiny.